Jack Halvery Mars, age 81, passed away January 23, 2019 while surrounded by his loving family. Jack was born on October 23, 1937 in Highland Park, Michigan, son of the late Raymond and Amy (Halvery) Mars. Jack was preceded in death by his wife Madeline (Sack). He is survived by his daughters Michele (Dean) Lundberg and Melissa (Pete) Israel as well as his five grandchildren Zachary and Madeline Lundberg and Grant, Kennedy and Delaney Israel. 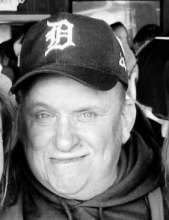 Jack Mars was a lifelong Detroit Lions' fan and wore his Michigan hat with pride to the very end. There will be no formal funeral arrangements. In lieu of flowers, donations may be offered on behalf of Jack to the Upper Peninsula Club, where he celebrated a membership for over 60 years. Donations to the Special Olympics of Michigan Area 23, 363 Pinehurst Drive, Canton, Michigan 48188 are also greatly appreciated. A celebration of Jack's life will take place at the Upper Peninsula Club, 10770 Calumet Rd, Whitmore Lake, MI 48189 on Saturday, January 26th beginning at 2:00pm. Every one is invited to wear local sports' team apparel just like Jack did! As is tradition, a pot luck dinner will be served. Please join us and perhaps share a story about Jack! He will be missed. To send flowers or a remembrance gift to the family of Jack H. Mars, please visit our Tribute Store. The Mars family kindly asks that in lieu of flowers, donations may be made to the Upper Peninsula Club. "Email Address" would like to share the life celebration of Jack H. Mars. Click on the "link" to go to share a favorite memory or leave a condolence message for the family.